For 2010, the GMC Yukon sees a few things simplified, as trim levels are pared down and the 5.3-liter V8 is made standard on all but the Denali (which continues with the 6.2-liter powerhouse). Additionally, all Yukons also have standard front-seat side airbags and a new USB port for the audio systems. In spite of the huge popularity of crossover SUVs -- those car-platform-based, stylish and sometimes even fuel-efficient family wagons -- there is still a place for traditional, truck-based SUVs. Yes, the latter are thirstier and typically aren't as nimble or space-efficient as a crossover. But strange as it may seem, some SUV owners actually do venture off-road (the soccer field doesn't count) and occasionally pull things -- large, heavy things -- behind their vehicles. 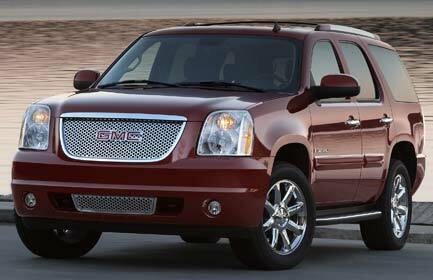 For them, the 2010 GMC Yukon makes perfect sense. Redesigned three years ago, the GMC Yukon (and its twin, the Chevrolet Tahoe) is the quintessential traditional full-size SUV. A robust, full-truck frame, rear-wheel or four-wheel drive with available low-range gearing, a beefy V8 engine, seating for up to nine passengers and plenty of cargo capacity are all part of the deal. Although the previous generations of the GMC Yukon (and Tahoe) were soundly criticized for their lackluster cabin materials and build quality, such is certainly not the case with the latest version, which compares favorably with competitors such as the Ford Expedition, Nissan Armada and Toyota Sequoia.